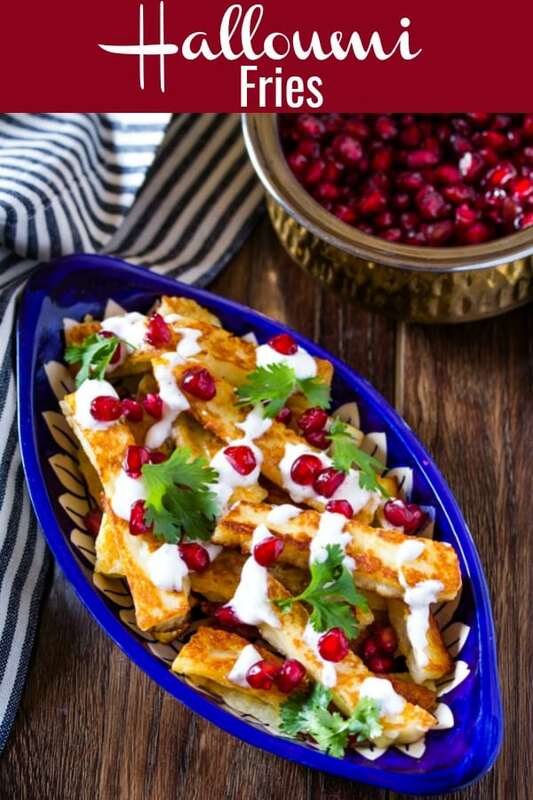 Crispy Halloumi Fries are a delicious Middle Eastern snack or appetizer, topped with a sumac yogurt dip, pomegranate seeds and chopped coriander. Looking for more delicious appetizers? Try these Dynamite Shrimp (most popular recipe on my blog!!) or these Baked Spinach and Cheese Samosa. Okay guys, let’s talk about fries. How good are fries? I think pretty good, and quite honestly I think there are very few people who aren’t happy when faced with a plate of fries. I mean seriously, who doesn’t like fries? But, what if I could tell you, that you could have Halloumi Fries, which is actually sticks of halloumi cheese fried until crispy. Move over, potatoes, you’ve got competition!!! Okay, so let’s talk about this Halloumi Fries situation. How has it been so long that I haven’t come across such delicious fried crispiness? 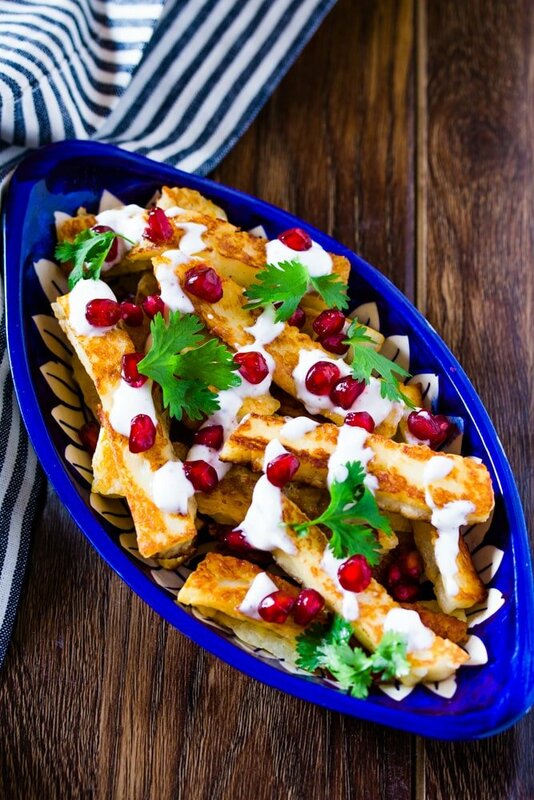 And then these fried halloumi sticks are topped with sumac yogurt dip and pomegranate seeds. We are talking major flavour fireworks, guys. But let’s backtrack a bit and talk about a few very important things, such as cheese. I love talking about cheese. Cheese FTW!!! What is Halloumi Cheese and What Does it Taste Like? What Do Halloumi Fries Taste Like? Halloumi Fries are crispy and salty. 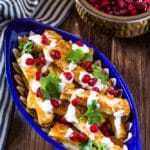 The sumac yogurt dip adds a nice balance to the saltiness and the pomegranate seeds add a nice sweet and sour kick to the whole dish. Halloumi Fries are seriously addictive. I was snacking them on all day long. How Do You Make Halloumi Fries? Halloumi Fries are super easy and quick to make. Start by cutting the halloumi cheese block into sticks, kind of like fries. Don’t worry if the aren’t all even though. Some people prefer to dust the halloumi sticks with some flour before frying, but quite honestly I skipped the step, because I feel like halloumi still turns out crispy without the flour coating. But you can of course try it with flour if you want. I’m the queen of skipping steps and making my life easy, so I directly fried the halloumi. Lol. Fry on medium heat until crispy brown on all sides. Top with sumac yogurt, pomegranate seeds and chopped coriander. Note: For the full recipe, scroll down to the recipe card. 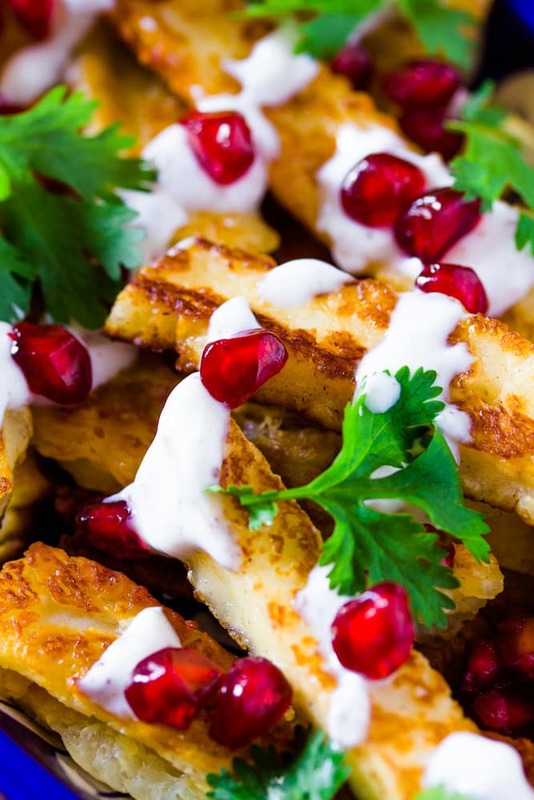 So if you’re looking for a unique, easy and yummy appetizer then look no further than these Halloumi Fries. 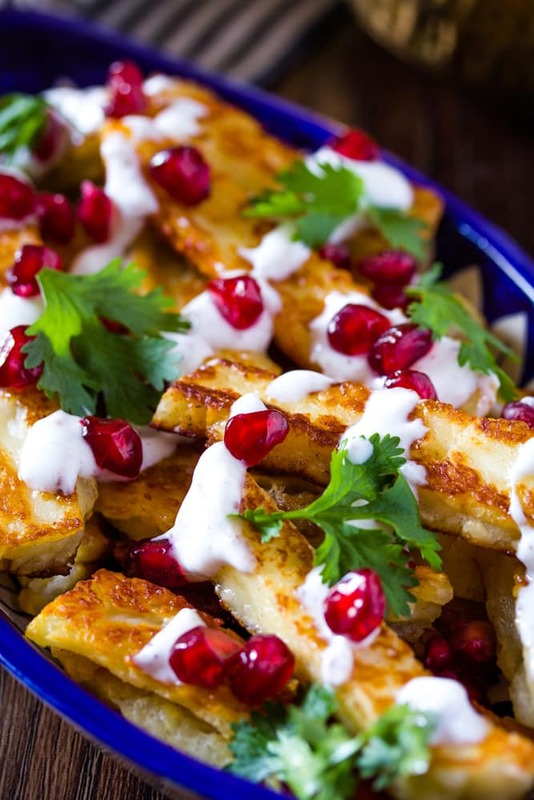 Crispy Halloumi Fries are a delicious Middle Eastern snack or appetizer, topped with sumac yogurt and pomegranate seeds. Cut the halloumi cheese into ‘fries’. Fry the halloumi fries on medium high heat for 3-4 minutes until golden brown. Set aside. Mix the greek yogurt and sumac until full incorporated. 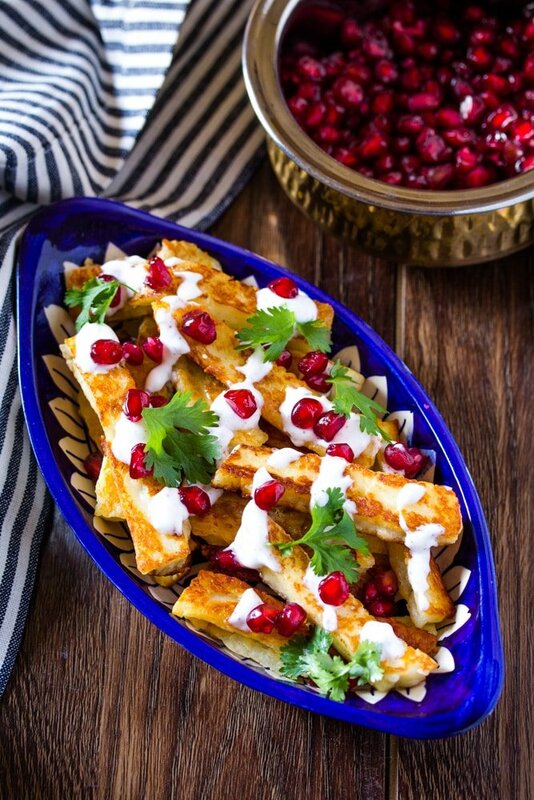 Drizzle the halloumi fries with sumac yogurt dip, and then top with pomegranate seeds and chopped coriander.